Q&A: Is it safer to use a Chromebook than a Windows laptop? Question from Patsy H.: My friend just bought a Chromebook after the salesman at the computer store told her they are safer to use than Windows computers. He said it’s impossible for them to catch a virus. I’d just like to know if you agree with him because I’m needing a new laptop myself. Rick’s answer: There’s no “right” answer to your question Patsy, at least if the choices are limited to “Yes” or “No”. I’ll discuss the salesman’s second statement first because it’s the easiest one to answer with certainty. To be blunt, he was incorrect when he told your friend that it’s impossible for a Chromebook to catch a virus. While they don’t run Windows, Chromebooks still operate by executing a series of programming instructions. That means they are susceptible to catching a virus if one manages to make it through the powerful security that Google has built into the Chrome operating system. That can and does happen on rare occasions. 1 – There are a lot more Windows machines in use today than there are Chromebooks. That entices the hackers of the world to primarily target Windows machines since they provide “the most bang for the buck”. If Chromebooks ever become more numerous than Windows machines that will surely change. 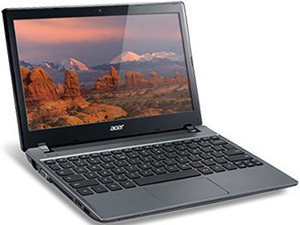 2 – Chrome OS is very basic and much less complex than Windows. That means there are simply a lot fewer potential avenues of attack for hackers to exploit. 3 – Chrome OS has security protections built-in that prevent the entire machine from becoming compromised by a single malicious website or snippet of dangerous code. When you close the tab containing a security threat, the remaining tabs will just fine. As you can see, using a Chromebook actually is “safer” than using a Windows PC. But that being said, Windows computers have some great advantages of their own. For example, there are thousands of powerful and truly useful programs and apps that run under Windows but not under Chrome OS. And the same can be said about Apple’s Mac family of computers as well. Bottom line: If you need a laptop primarily for Internet use and you want it to be as secure as possible, a Chromebook is indeed an excellent choice. But if you need a powerful machine that can run (and do) pretty much anything you’d probably be better off sticking with either a Windows laptop or a Macbook. Bonus tip #1: If you decide to go with a Windows laptop you’ll find step-by-step instructions for rooting out and removing viruses and other forms of malware from it in this post.